CanadaVet.com Blog: The Annual CanadaVet Pet Photo Contest is Finally Open! 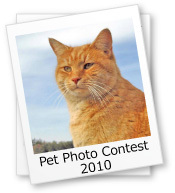 The Annual CanadaVet Pet Photo Contest is Finally Open! We all love cute photos of pets! And judging by the success of our photo contest in past years, we know our customers do too! Here is your chance to share your beautiful pet photos and maybe win some great prizes. Just like every year, the contest has two entry levels; one for adults and one for children 12 and under and it's free to enter! Also, this year for the first time we will be awarding the People's Choice Award for the most popular photo on Facebook! The contest starts on September 15th, 2010 and closes midnight, October 15th, 2010 (PST) – so get your camera ready and start submitting your photos! Click here to find out how to submit your photos and to read the rules of the competition. Click here to submit your photo via Facebook (Remember to click the Like button on the page and then post your photo on the wall with the photo title and description). Click here for some handy tips on how to photograph your pets.